The island writer on coming back to Lytham, writing, her new book and how maybe women should run the world. Last time best-selling author Victoria Hislop came to Lytham, she really enjoyed it. So the Oxford-educated novelist is looking forward to returning again in less than two weeks’ time, for a meet- and-greet session at Lowther Pavilion, to coincide with the publication of her latest work, The Sunrise. The Lowther visit is Victoria’s only northern tour date, so it’s a rare chance to hear her speak about her new book, The Sunrise. Set in Cyprus in the summer of 1972, it follows the story of an ambitious couple about to open the island’s most spectacular hotel, where Greek and Turkish Cypriots work in harmony. Two neighbouring families, the Georgious and the Ozkansm, are among many who move to Famagusta to escape the years of unrest and ethnic violence elsewhere on the island. But beneath the city’s facade of glamour and success, tension is building. When a Greek coup plunges the island into chaos, Cyprus faces a disastrous conflict. Turkey invades to protect the Turkish Cypriot minority and Famagusta is shelled. Forty thousand people seize their most precious possessions and flee from the advancing soldiers. In the deserted city, just two families remain. Part of the Cypriot city of Famagusta was fenced off by the Turkish army after being captured, in the invasion of 1974. And it still remains in that state today. The Greek Cypriots who had fled from Varosha were not allowed to return, and journalists are banned. It has been frozen in time with houses, department stores and hotels empty and looted, even tiles on bathroom walls. “This piece of history is still there, just living like this. “There is still a ghost town there in Cyprus. I found it so extraordinary. And what about the writing process itself, is it something she enjoyed? “It would be wrong to say I enjoyed reading about all these terrible things that people have done to each other. “I had to of course research parts of history and I can’t say I enjoyed reading about those painful events. The story of conflict and its consequences of course has great relevance today, with the current troubles in Gaza, Iraq and Ukraine. “My approach to it, both myself and things that happen in my books, is that these are decision that were made by men. “But the consequences are not just for men, they are also for women and children. “I’m not anti-men at all. 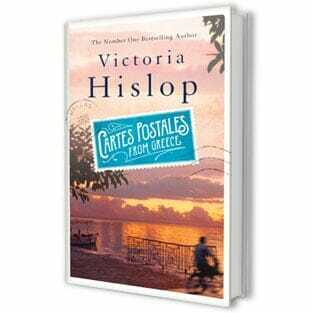 Victoria, who speaks fluent Greek after having lessons for several years, says foreign climes prove an irresistible draw – and they are where she gets her inspiration. She said: “I feel very comfortable being a foreigner. I don’t find languages that difficult, I speak Greek, French and bits of Spanish and German. “I’m starting to write a few things in Greek, one day I may write a novel in Greek and have it translated into English! The first year of learning Greek I spent learning the different alphabet and the grammar is quite complex – each noun has three cases, masculine, feminine or neutral. And sometimes it can quite illogical. But I can now speak pretty fluent Greek. It’s always been travelling which has given me inspiration. But we should always be prepared for surprises. She says the success of her best-selling first book, the 2005 novel The Island, took her by surprise. Not least because of the subject matter. Victoria became an ambassador for LEPRA, the international leprosy charity, which enabled her to travel to India and see the work it carries out. And her final words to Fylde coast readers: “People are welcome to come along to Lytham, whether or not they have read my books.